Eco Friendly Craft Ideas: Make your own upcycled puzzles! Here’s an easy project for a cold, rainy afternoon. 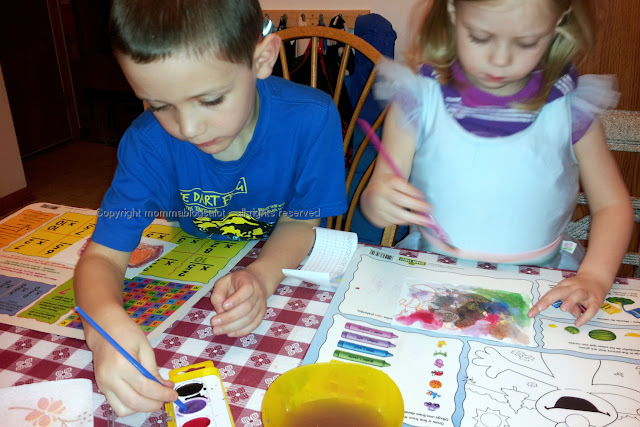 Kids are bored beyond belief and need a new distraction? Pull out a piece of cardboard from your recycling with an interesting picture and cut it into a jigsaw puzzle. We used the box from a frozen pizza. You could do this with a cereal box, the box a new toy comes in, frozen pizza boxes, etc. Sky’s the limit here really – and you can make the puzzle as easy or as complex as you want to suit your kiddos needs. If they lose a piece (or twelve) you won’t really care because it didn’t cost you anything more than time! What simple rainy day activities are your favorite? Anybody else majorly ready for the weekend? Why I Want to Choose the ‘Disadvantaged’ Local School (and Why I Might Not) by Motherlode @ The New York Times – Reminds me a lot of our local school. Sign your kiddos up for the FREE Junie B. Jones Reading Club! Chocolate Strawberry Nutella Cake @ The Pioneer Woman – I watched her make this on her Food Network show and it looks even better on tv than on the blog, if possible. A Find Your Style Quiz @ KraftMaid Cabinetry – I am kind of obsessed with these click on pictures of pretty things and we’ll tell you all about yourself quizzes. According to this one I am “natural and warm” – how about you? Jen Hatmaker says she’s the Worst End of School Year Mom Ever but I think she’s in good company. Anybody else feeling that End of School Year angst? Raise your hand if your phoning it in at this point, too! Lastly, enjoy these three videos and have a great weekend! 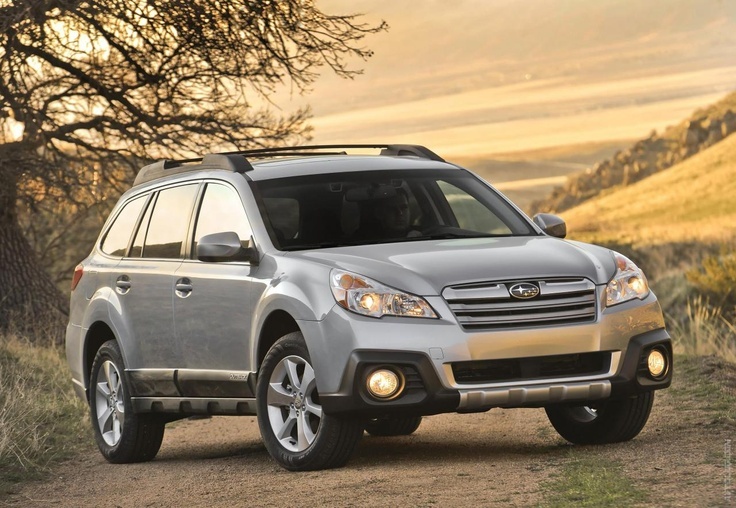 Mothers Day is this weekend and even though I am prettttty sure I won’t be getting the Subaru of my dreams, it doesn’t hurt to drool a bit, right? Here are some other things that top my Dream Big Momma! Mother’s Day Wish List. A macro lens for my camera – I have a little macro filter that is fun but the big bad lens would be awfully cool someday. I’d settle for a wireless remote to make taking pictures of me and the kiddos easier. Some cute ballet flats like these pretties at J Crew. Alternatively, twenty minutes alone in Famous Footwear and permission to buy something just for fun would be pretty cool, too. New counter tops like this gorgeous hardwood counter top on Pinterest. Or something pretty to put on the counters I have like this cute vase from IKEA. A weekend at some fancy spa & resort where I get pampered for hours and get to sleep in as late as I want. Or a massage at the Princeton Club. Breakfast at a little cafe in Paris and then a day of sight seeing, museum hopping and picture taking. Or breakfast in bed (or at the kitchen table – less messy) and home made cards & drawings from the kids. What would be on your Dream Wish List for Mother’s Day? What are you actually hoping for? It’s been one of those lazy mornings where the idea of taking off my bathrobe is more than I can bear. After deciding that it would definitely be a hide indoors kind of day, I knew that I’d need to pull some fun project out of my hat to ward off those guilty mom pangs that come part and parcel with laziness. A Kiwi Crate kind of day, if ever I saw one. Around the time that we adopted our dog, Kiwi Crate sent a very timely crate that’s all about making your own pets and a pet playground. I briefly wondered if Kiwi Crate had hidden cameras in my home, then set the crate aside. Having a new pet of our own to care for and keep from destroying everything, I knew that random arts & crafts projects probably weren’t going to happen just yet. We won’t talk about the fact that that was two crates ago and that my office is starting to gather a collection of little green boxes. Anyway, the dog was safely napping in his crate, my coffee was gone and my daughter was looking for trouble so I diverted her attention with, “Look BB! Let’s make Pom Pom Pets! What color should we make first!!! !” Worked like a charm. 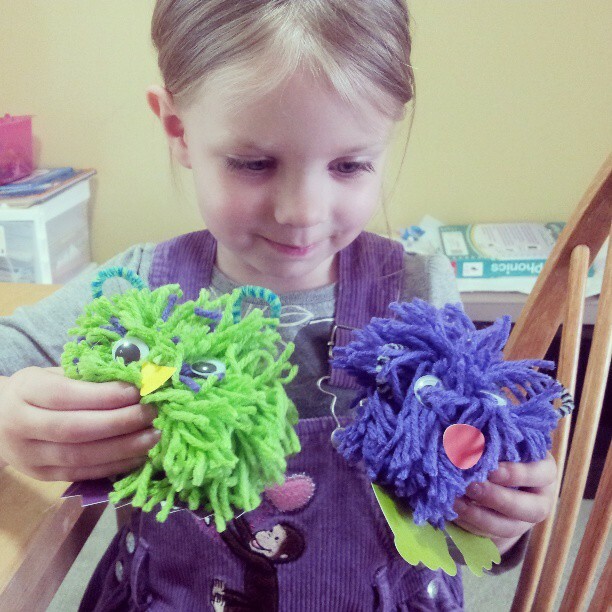 These little pom pom pets were super easy to make – I was surprised how little effort was involved. Wrap some yarn around a little c shaped yarn winder (included in the crate), tie tightly in the middle with pipe cleaner then snip the loops on either end and trim if needed. Apparently you could also use a rectangle shape of cardboard, a fork or even just your fingers. 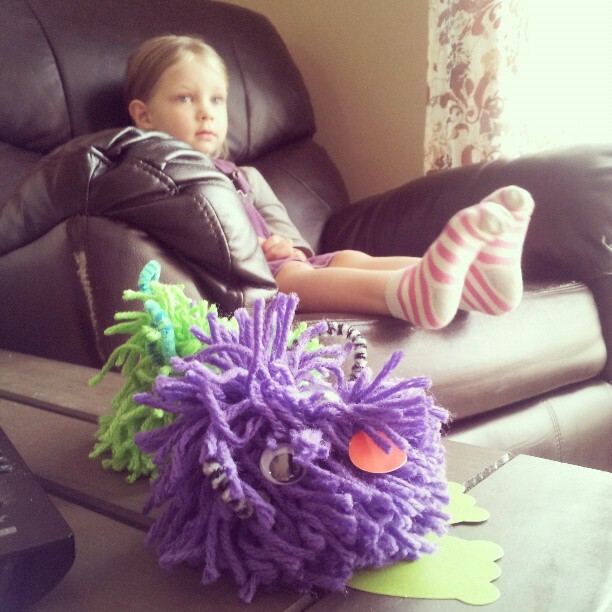 Add googly eyes and other decorations to make your own Pom Pom Pet. BB named hers Sofia and Amber because she’d just finished watching Sofia the First. Of course she loved adding the decorations to her little pets and naming them and she did a little bit of the winding and cutting but quickly decided that it was more effort than she felt like putting into the project – but it took me only a couple of minutes to do the more involved steps. Her favorite part of the project may have been taking her new pets to the living room afterwards to watch more Sofia the First with them, but I’ll still consider this a successful morning project. I know a lot of us are struggling to find the happy today, in wake of the tragedy that happened at the Boston Marathon yesterday (and other places, too, from what I’ve heard). I spent yesterday ignoring the news and kind of doing the lalalala thing. It’s how I cope, because if I let all that in, read the news stories, think about the awful… it tends to overpower me and I find myself in dark dwelly places. Instead I chose to catch up on magazines, take random style quizzes online, play those silly Facebook games – and catch up on laundry and snuggles with the kids. I checked in with Facebook occasionally to see if all my loved ones on the East Coast were okay (yes) and otherwise ignored it. This method served me well yesterday so today I follow suit. Luckily, I’m not alone – lots of my friends and bloggers are doing the same. Need a laugh today? Looking for a project to distract you and make you smile. Check out this cute idea at Mommy Shorts – she is taking pics of her kiddos in coffee mugs and asking her readers to do the same. No photoshopping required here, but if your kids are wiggly and all limbs like mine, some creative cropping or pleading may be in order. BB here is more of an overflowing #babeinamug but adorable all the same. Extra incentive? If you take a photo and share it on her Facebook page or use the hashtag #babeinamug on Instagram, you’ll be entered to win a random drawing giveaway for a Mommy Shorts mug. I am crossing my fingers and toes for one of those bad boys! If you are playing along, share a link to your pics in the comments section so I can see the cuteness! 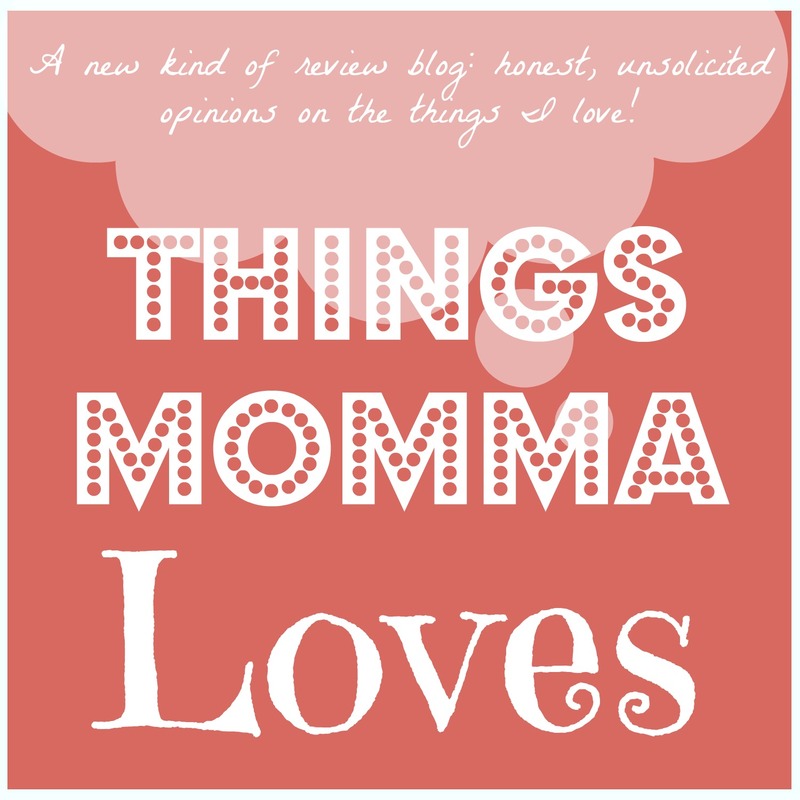 Most of us mom bloggers or bloggers who are moms have heard of Pamela Druckerman’s books about French parenting. I have always been intrigued by these miracle women in France who seem to have all the answers – they don’t get fat, their kids eat anything and sleep through the night at 3 months old and never throw temper tantrums. Whether all of these things are true about all French parents and mothers is up for debate but I think the parenting cultures around the world all probably have some great lessons that we can learn from one another. “Motherhood itself is a whole different experience in France. There’s no role model, as there is in America, for the harried new mom with no life of her own. French mothers assume that even good parents aren’t at the constant service of their children and that there’s no need to feel guilty about this. They have an easy, calm authority with their kids that Druckerman can only envy. Of course, French parenting wouldn’t be worth talking about if it produced robotic, joyless children. In fact, French kids are just as boisterous, curious, and creative as Americans. They’re just far better behaved and more in command of themselves. While some American toddlers are getting Mandarin tutors and preliteracy training, French kids are- by design-toddling around and discovering the world at their own pace. With a notebook stashed in her diaper bag, Druckerman-a former reporter for The Wall Street Journal-sets out to learn the secrets to raising a society of good little sleepers, gourmet eaters, and reasonably relaxed parents. She discovers that French parents are extremely strict about some things and strikingly permissive about others. And she realizes that to be a different kind of parent, you don’t just need a different parenting philosophy. You need a very different view of what a child actually is. I loved reading about how differently other cultures raise their kids and the potential pros and cons to different methods. I think that French parents have a lot going for them from the start with their universal free preschool and access to affordable childcare via creches. Their childcare really sounds amazing to me and though I stand by my decisions to stay home with my kids, I think the French moms are lucky to be able to go back to work without worrying about their kiddos so much. It seems to me that one of the biggest advantages that French parents have is a strong underlying faith that their parenting methods will work. They use time tested methods and truly believe they are doing what is best for their kids and themselves. In America there are so many varying parenting methods for every aspect of parenting so that it feels as though we are reinventing the wheel with every decision we make from feeding our kids to sleep training and discipline. We’re all doing something a little different and I bet a lot of us question if we chose the right method or not. The French don’t seem to have this issue – they are all doing pretty much the same thing, working off the same frame for discipline and the education of their children. They’ve got cadre and I’m pretty envious. Her book is funny and insightful with a lot of great information, fun recipes and a little peek into a culture I’ve long admired. If you can’t raise your kids in France, you can at least live vicariously through Druckerman and maybe pick up a few tips and recipes along the way. Have you read Bringing Up Bébé or any of Druckerman’s other books? What did you think? It seems I have a preschooler at home with me again. I mean, obviously I knew that already, but sometimes I forget that all the ABC’s and 123’s and learning to read and write and recognize shapes will need to be taught all over again because apparently kids don’t learn everything through osmosis. BB and I have been slowly picking up new activities with an educational slant to them. We subscribe to Kiwi Crate and I scourge the Target dollar bins for deals on little educational books and toys (they have seriously great stuff over there). We DVR some of the more educational kids’ shows on television and sing the ABC’s. I download apps and sometimes remember to let her touch my phone for a few minutes and play with them. Another great source for learning materials is, of course, the internet. There are all sorts of amazing printables online and a lot of them are free. 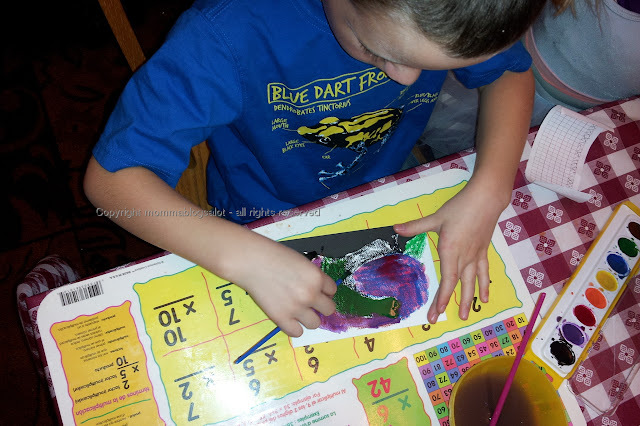 I found this awesome numbers printable at Modern Parents Messy Kids designed by Kaley. I printed out the first 5 cards to use with my daughter this morning after our plans for the day were unexpectedly cancelled. I used the cool paper flippy double sided printing option on our laser printer for the first time and 5 sheets of paper later I sat down with BB who had gathered 5 wooden blocks per my instructions. We then practiced tracing and counting the numbers one through five. 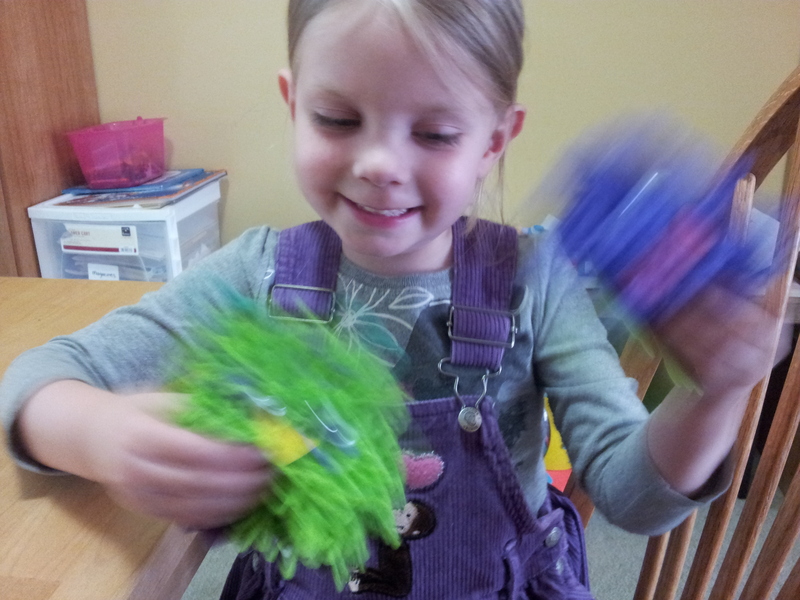 These were just challenging enough to be educational but easy enough that she never got frustrated. 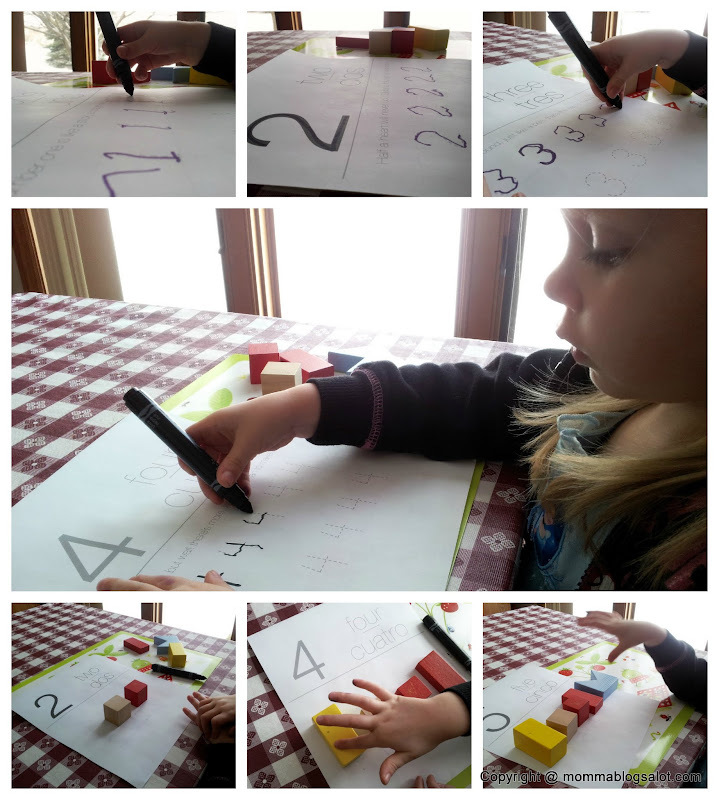 She understands the concept of tracing and recognizes her numbers but definitely needs help practicing her hand coordination to actually write the numbers herself. This was an excellent way for her to practice. We are looking forward to writing the numbers six through ten soon! Kiwi Crate is making me look like Mom of the Year! I’m one of those people who go through bursts of serious productivity and then long, languid hours of sitting in my bathrobe watching ABC family or playing Facebook games. I have serious aspirations to be That Mom who crafts with her kiddos all the time, cooks healthy and varied homemade meals, is a domestic diva and wears high heels but that vision only comes through sparingly. So finding out about a company like Kiwi Crate was kind of a godsend for me because it eliminates all of the tedious planning and shopping and idea-coming-up-withing and just lets me have fun creating cool things with my kids, minimal effort required on my part. This month the kids and I made jingle bell bracelets, went penguin bowling and designed our own Aurora Australis inspired postcards using pastel crayons and watercolors – and I didn’t even have to bleach my couch this time (ask me about our last adventure with pastel crayons, go on, I dare you!) or anything! Kiwi Crate is making it possible for me to be the fun mom who lets her kids paint right before dinner without having a panic attack and you almost don’t even notice the fact that my daughter prances around in tutu style leotards like all the time and sometimes over several layers of other clothing. Our crate subscription plan is just $19.99 a month and includes everything we need to do two fun projects related to a monthly theme like Farmer’s Market, Antarctic Adventure or Family Game Night. For an extra $8 you can get on a sibling add-on which just means they’ll provide a few more of the materials involved so there’s no fighting over stuff but honestly their standalone crate has been plenty for my kids, ages 3 and 6. This probably won’t be the last time that I sing the praises of the geniuses behind Kiwi Crate (it certainly isn’t the first time either) – ever since we signed up last fall I have been blown away by the high quality products and care that goes into each crate – and the fact that I’ve been able to introduce my kids to so many cool concepts, projects and ideas is just icing on the super cute cake. 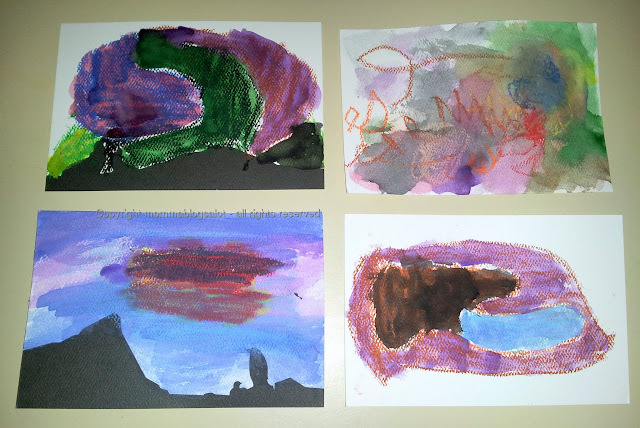 our Aurora Australis post cards, painted last night before dinner. Can you tell which one is mine? It’s been awhile since my daughter and I have done a Kiwi Crate project together – life has been hectic lately and I’ve found myself operating on bare minimum lately – getting done what’s absolutely necessary and ignoring a lot of the rest of it. We all get that way sometimes, right? Anyway, when I got an email saying our next crate would be shipping soon it reminded me that we had still left our last box unopened. One thing I love about Kiwi Crate is that it reminds me to prioritize doing fun projects with my kids. It’s easy to get lost in the shuffle of classes, errands and laundry and when life gets busy sometimes we find ourselves dropping the fun stuff so we can get the boring stuff done. Luckily, Kiwi Crates don’t expire. So saving them for the rainy day when you need them or for the blessedly quiet weeks when you have time to really enjoy them with your kids – is totally an option. 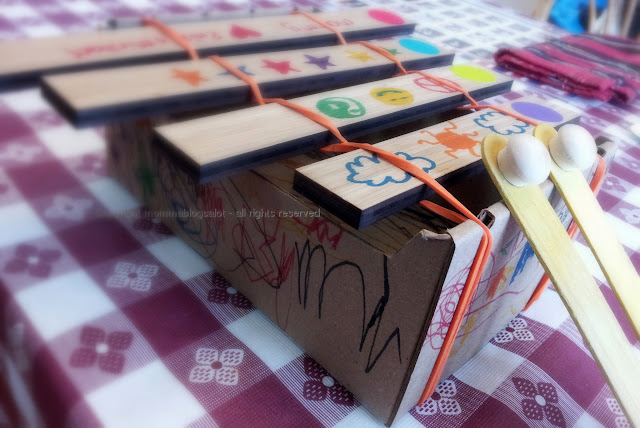 This week we decided to craft a xylophone together from our Making Music Crate. I let my three year old be much more involved in this craft than I have with previous ones. I have a tendency to take over crafts – this I acknowledge – so I tried to step back a bit with this one. I even gave her markers. Washable markers, thank goodness. 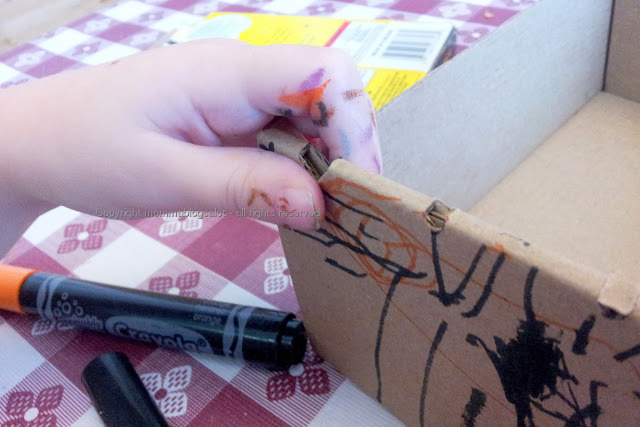 She spent a long time coloring the box which would make the base of the xylophone, drawing careful and careless drawings and scribbles on every corner, nook and cranny. It took forever, I’m not gonna lie. 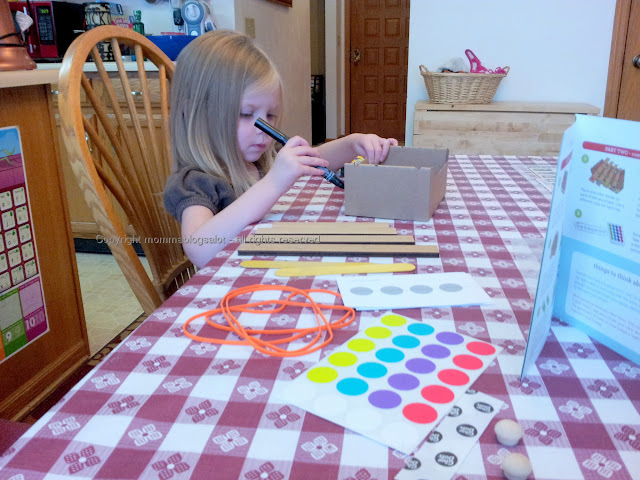 I spent that time reading the instructions for the rest of the project and decorating the xylophone bars – mommy likes to color, too! After we were done decorating we assembled the xylophone. I let her put two of the orange rubber bands on each side of the box, then I sneakily straightened them out when she wasn’t looking and helped her insert the xylophone bars. I assembled the little mallets while she was decorating, using Popsicle sticks, glue dots and little wooden ball things (a technical term). Once it was all assembled, the only thing left to do was compose some beautiful music together. I let her pick the colored dots which I attached to our sheet music (photographed at the top of this post) and then showed her how I could play the music she had composed and then let her try. Then she disassembled the xylophone while I was in the bathroom. But hey, I guess that means we can do the project again later, right? Kiwi Crate cannot turn your preschool set into perfectly well behaved angels who never draw on your couch with pastel crayons, but they can provide hours of educational fun for only $19.99/month.